Since 2002 the Sothern Ocean takes up an increasing amount of the greenhouse gas CO₂ from the atmosphere. This is the result of two studies recently published in the journals Science and Geophysical Research Letters. The oceans are known as an important CO₂ sink. It is suggested that until now they removed 25% of the human made amount of CO₂ from the atmosphere, meaning a significant contribution in slowing climate change. The Southern Ocean (here: below the 35th parallel south) is particularly productive in this case. Although it covers only 26% of the oceanic surface it contributes approximately 40% to the ocean´s CO₂ sink. In the 1990s studies had suggested that this absorbing capacity of the sea around Antarctica was weakening. A positive feedback effect was discussed: That it was global warming itself which provoked this weakening and thereby contributed to its own acceleration. 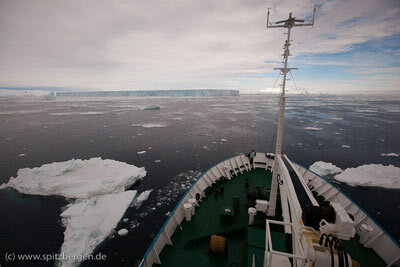 Now, by analyzing long-term data from atmosphere and surface water of the Southern Ocean, the new, recently published studies show that the Antarctic Sea began to strengthen its CO₂ absorbing capacity again in 2002 and continued to do so until at least 2012. The reasons for this change are still not clear. There is one suggestion, that in winter an increasing amount of deepwater is getting to the surface; water that didn´t have contact to the atmosphere for several hundreds of years. If the new strengthening of the oceans CO₂ sink is again provoked by global warming, cannot be negated. In this case at least the effect would be a welcome one.